Thank you for writing this blog and all the great information you provide. I have a vocal problem, and I can't seem to find an answer. Hope you can help. I have been singing all my life, and have had proper instruction on how to sing, warm-ups etc. However, the last couple years I've been experiencing some strange vocal issues. First it started w/ me losing my voice easily, and not having power. In the last year it has progressed to having trouble recalling melodies and having trouble singing on key. I've been to two different ENT doctors and they said my vocal cords were fine. I've also seen chiropractors and an Alexander Technique Instructor. This has helped SOMEWHAT w/ the vocal power, but I'm still experiencing issues w/ singing on key and recalling melodies. I should note that I have TMJ disorder. Can this affect a nerve near the ear and cause this sudden tone-deafness? Please help. According to the medical website DiagnoseMe.com, TMJ sufferers sometimes do report diminished hearing. But I also believe that a TMJ problem can cause a singer to stop truly listening and AIMING at pitch, especially if there is a ringing in the ears (tinnitus) to conflict with the tones you want to accurately hit. To deal with this, you obviously need to address TMJ solutions, but it's also important to get back to some pitch practice with a trusted coach. There are many factors which can contribute to TMJ (temporal mandibular joint) syndrome. The TMJ Association website lists possible contributing factors such as jaw injuries, Arthritis, dental procedures, genetics, hormones, infections, auto-immune diseases, over-stretching of the jaw such as when being intubated, and clenching or grinding of the teeth. When I was a staff-singer at a jingle company in Memphis, I once had a terrible bout with TMJ. It was so bad I had to open my mouth before they turned the mic on so my jaw wouldn't cause a clicking sound! In my case, it was caused mostly by a new tooth filling -too high- which caused me to grind my teeth to try and close my bite. It was cured by the dentist filing the filling down for a better fit, a mouth guard to stop my night-time grinding and a short-term course of prescription muscle relaxer to relax my jaw. Whew! Not all causes are known. Sometimes, with singers, I think it's a case of which comes first, the chicken or the egg? Tight jaw contributes to tight throat. Tight throat will cause a tight jaw which is trying (tensing) desperately to articulate. And as I said, other physical and psychological issues a singer is dealing with can often take the attention away from aiming at pitch, and indeed, affect memory. 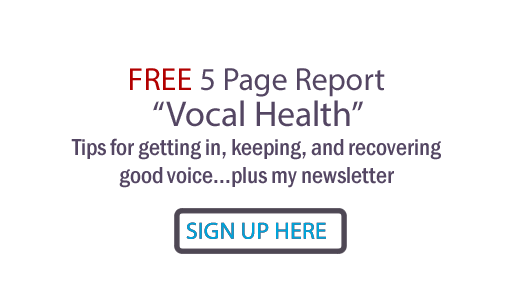 If the problems persist, have them checked out by a medical professional and/or a personal vocal coach you trust. The voice holds many mysteries, but the secrets can usually be unlocked.